The Resort at Pedregal, formerly known as Capella Pedregal, is one of the most luxurious resorts in Los Cabos, if not all of Mexico. 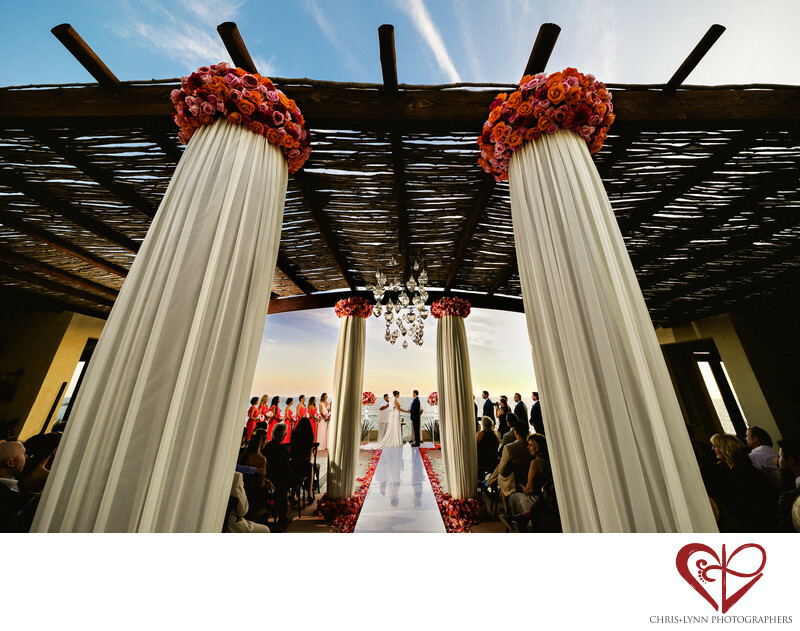 Combining the natural materials & warm tones of Baja with contemporary design, the venue offers several incredible locations for wedding ceremonies. This ceremony took place in the main lobby of the hotel with guests seated beneath a covered palo d'arco canopy and views out to the Pacific Ocean. Sunset is a popular time for ceremonies at this location - what better time to exchange vows than when the sun is dipping into the Pacific? Sunset ceremonies in Cabo are beautiful but can be challenging. We love to shoot silhouettes of the bride and groom against a bright orange sky, but during a ceremony, it's important to have images where the couple is properly lit and the colors of the sky are still vivid. For this image, we used an off-camera Canon 600EX II-RT Speedlite flash to illuminate the bride and bridesmaids which. combined with the Sigma 12-24mm f4 Art wide-angle lens (one of our favs! ), contributes to the very dramatic feel of this image. This image was shot at our first wedding using our new Canon 5D Mark IV camera bodies, and we were very impressed by the greatly improved dynamic range capabilities of these new cameras. Location: The Resort at Pedregal, Camino del Mar 1, Pedregal, 23455 Cabo San Lucas, B.C.S., Mexico . 1/200; f/5.6; ISO 400; 13.0 mm.